Obi has been bored all week. I think this is the feline version of cabin fever. He walks around the house crying, “bored, BOred, BORED.” The only things that quiets the cries is digging under the couch for a toy – his pink fuzzy or the flat mousie will work. Only those. The teddy bear mousie, a usual favorite, isn’t doing the trick this week. This morning, the pink fuzzy was in the middle of the floor. The flat mousie was on the loveseat. So I dug for something else. And I found! The! Blue and Pink! FUZZY! I was so excited. I set it in front of Obi. He looked at the fuzzy. WHAP. 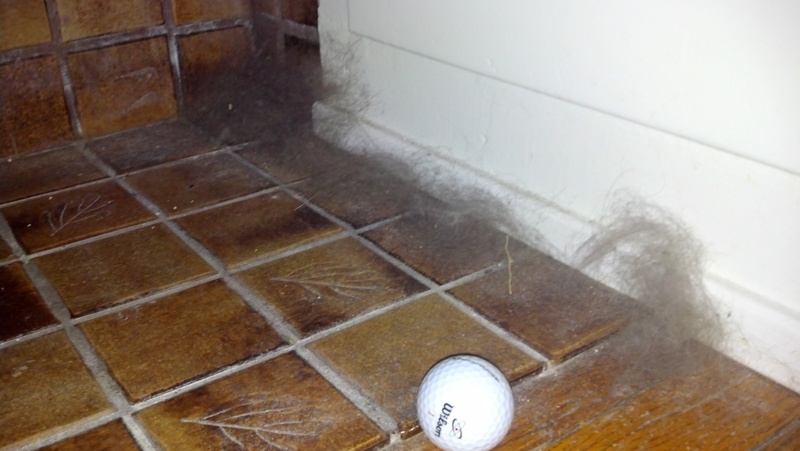 The fuzzy went under the couch. Way, way under the couch. And with a flick of his tail, the brown kitten went over to his pink fuzzy and snuggled down next to it. Blue? He doesn’t think so. It’s Thunder Thursday! This will boring for those of you who aren’t on Twitter. But if you are, may I suggest you follow these cats? And then I found Anakin. He has two legs because he was born without back legs or a pelvis. Here’s a video. He’s AMAZING. In preparation for the floor guys, I folded all the blankets we have in the living room. The quilt folded and draped on the back of the couch gave Obi a new opportunity. Today, Obi laid across the tops of both of my arms while I worked on the laptop on the couch. He stretched. He purred. He napped. He’s getting good at this snuggling thing. But Oliver is still the master. The morning started as all Sunday mornings do: with Obi bored and trying to get someone ANYONE to do something with him. Eventually it worked and I got up to rub his belly and find his flat leopard skin mousie. Then I inspected The Boy’s efforts of moving stuff back into the breakfast nook. The kid did good. 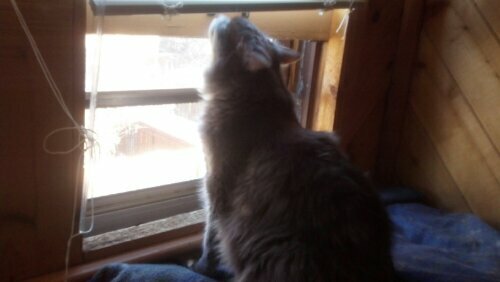 Obi appreciates that his table is back for optimal bird watching. Then I went downstairs to work on some necklaces that I’m hoping to get done and into the local gallery for Valentine’s Day shoppers. Obi came down to supervise. Then he realized that there was something else we needed to do. Saw – Of course The Girl wouldn’t let the brown kitten scratch his chin on the actual saw blade. But the frame has potential. The top part, where the blade is held, was pretty good. And the little twisty knob for tightening the frame was also pretty good. Needle nosed files – The flat one was good! We filed Obi’s chin for about five minutes of full purr pleasure. He could not convince The Girl to use the round one. Once again, The Girl refused to actually let the brown kitten cut his face open in pursuit of the perfect chin scratch. Ball peen hammer – Meh. Rawhide mallet – Fun to chew for the ten seconds The Girl allowed it. Not great for chin scratching. Pliers – The little ones are good, but The Girl wouldn’t hold onto them tight enough for the brown kitten to get some really good leverage. Bench block – It turns out the best chin scratcher on the entire workbench is the bench itself. Sitting on The Girl’s lap puts the kitten at the perfect height to scratch his chin on the block. And then the experiment was over because the rotten Girl wanted to actually do work. That wasn’t exciting so Obi left to seek out The Boy. Later on, when I was laying on the couch, the brown kitten discovered – or rediscovered – the best chin scratching tool of all…Girl fingernails. 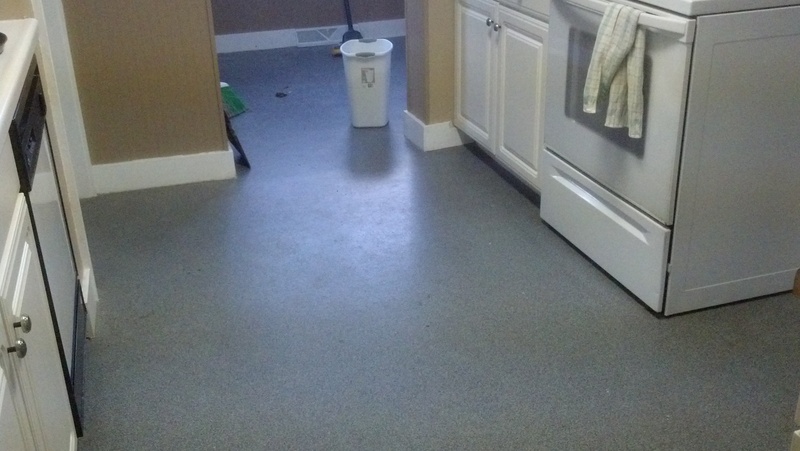 Our house has…had…an ugly kitchen floor. Originally we thought it would be great because it would hide the dirt. Then we discovered that it was not great because even when it is freshly cleaned it looks dirty. So today…it went away. To prepare for floor guys, we had to empty the kitchen and breakfast nook into my office and the dining room. So that was weird. Then yesterday I moved one litter box from my office up to the reading nook, along with the kitty crunchies. More weird. Also weird for me last night when someone used that litter box and I couldn’t place the sound. 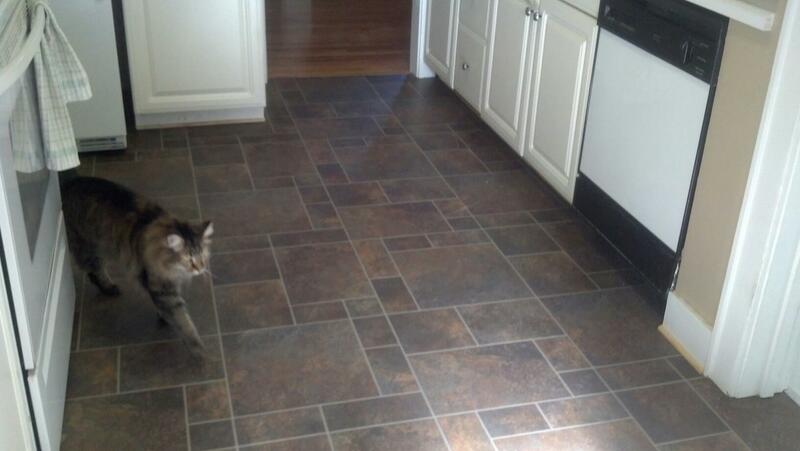 When the nice floor guy showed up, I showed him to the kitchen. I should tell you that this AWESOME floor guy knocked very gently instead of ringing the doorbell – cat owners love that. Obi came with us to see what was going on. Floor guy talked to him. Cat owners love that, too. 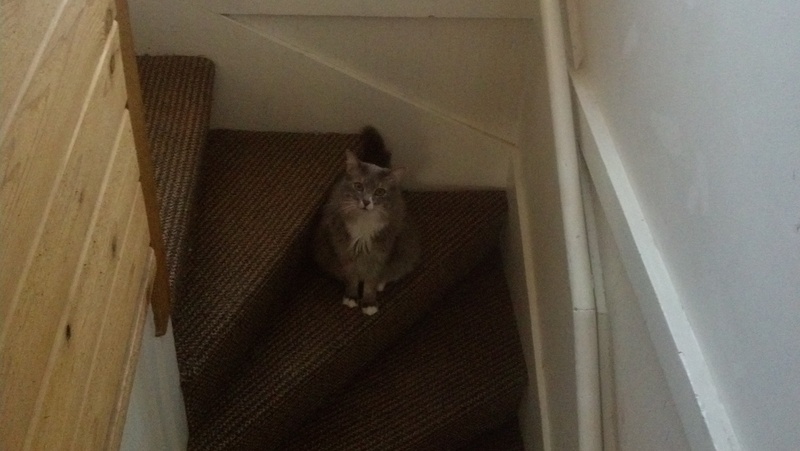 I told him that I was hoping the cats would go upstairs with me but if they decided to “help” him, to let me know and I’d lock them up somewhere. I wasn’t looking forward to that – there’s no place in our house with doors that I would want to spend a day so I’d have to leave them alone. Luckily, they did not get in the way. At first, Kitten Thunder and The Girl were doing fine upstairs. There was a lot of banging and stuff on the main floor so the kittehs were happy to stick close. 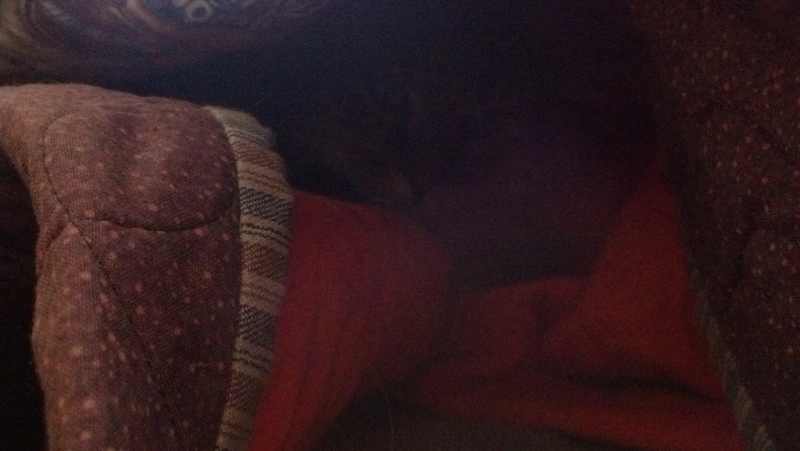 But the Obi, my brave brown kitten, had to see what was going on. He would creep to the top of the stairs. Then he’d disappear downstairs for a while. After a while, a kitten streak would zip up the stairs and onto the loveseat with me, wide-eyed and breathless. Oliver wanted to be brave but it just isn’t in his nature. He did get as far as the top of the stairs. After four hours of work, Oliver was glassy-eyed. That is an awful lot of sleep deprivation for a grey kitten. He was swaying on his feet. He was eating kitty crunchies in a desperate attempt to keep awake. Finally, he went to the cat shelf and settled in on the blanket. But he could not sleep with the noise and the scary downstairs so he stared into space. And stared. and stared. Then, things got worse for the grey kitten. He needed to use the litter box. But not the one I brought upstairs. Such a conundrum: to pee in the poo box, or to venture downstairs. As I had hoped, he overcame his boundaries and used the box upstairs. Well ahead of schedule, the floor was done. Obi and I went downstairs to talk to the floor guy and look at the new floor. And then? Oliver, Obi and I took a nap on the couch. Having floor installed is exhausting. It’s Thunder Thursday! 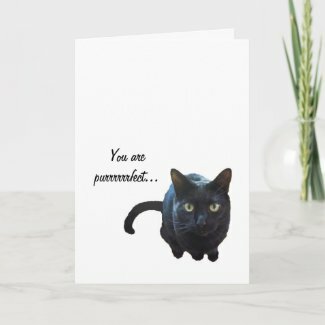 Today, I am shamelessly plugging the Kitten Thunder Zazzle store’s newest products, perfect for Valentine’s Day OR Singles Awareness Day. 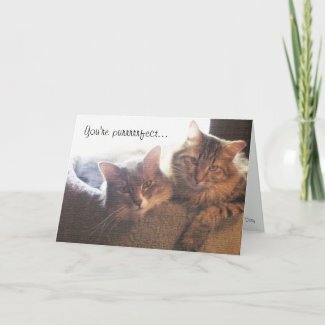 We built two cards – one for the lovers of fuzzies and one for lovers of short haired kittehs. The grey kitten, sitting on the floor by the couch, looked at me with a steady gaze. I patted my lap. He did that stretch that starts at his front toes, travels up his arms into his shoulders then travels through his eyebrows and out through his ears. 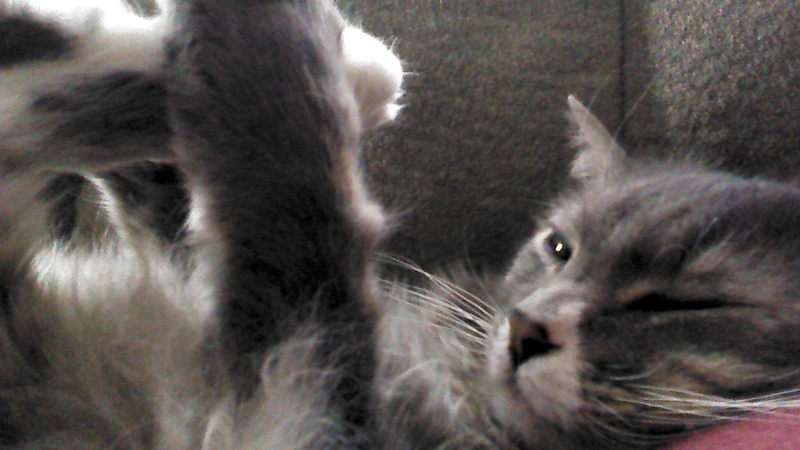 The grey kitten swivelled his head to considered The Boy sitting on the recliner. 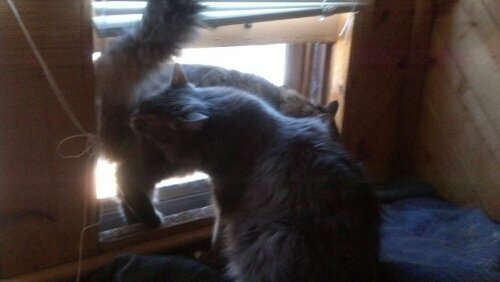 The grey kitten licked his tail. “Ooooooooooliveeeeeeer! Laaaaaaay wiiiiiiiith meeeeeee,” I whined. I patted my lap, now covered by quilt, again. Oli walked away. Unable to remember where he left me once he arrived in the hallway, he called out. “Oliver, come here,” I responded. The grey kitten walked back into the room and sat on the floor by the couch. The grey kitten scratched his ear. He looked at me. Finally, Oliver jumped onto my lap and we had a snuggle. If I didn’t know better I’d think he was showing me how it feels to be ignored when he’s trying to get me up for breakfast. And then he got so carried away with licking my finger than he chomped down on it. Last week, Cheyenne had some cold weather. Cold, even, by our standards. We spent about three days with temperatures that never rose above zero. Cold, I say. So on Friday, I was a little bit surprised to find I was breaking a sweat in the car as I drove across town. A quick glance at the temperature gauge revealed that it was FIFTY degrees. A-mazing! I finished my errands and rushed home. As soon as the requisite belly rubbing was done, I opened a window. Mmmm, smell-o-vision. 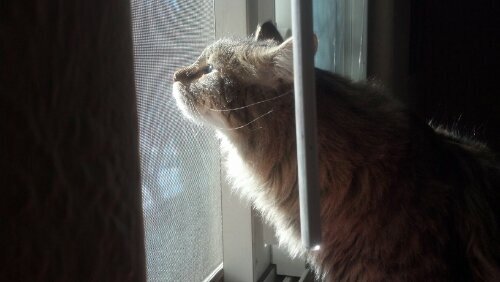 A cat can forget how wonderful Out smells. I went upstairs to find Oliver and open a window for him. Laying on the loveseat in the reading nook, he was not interested in moving to the cat shelf. I picked him up and moved him anyway. Aaaaah, glorious smell-o-vision. Thank you, Girl, for forcing me to move.